The Family Table | Out to Eat | Kids VT - small people, big ideas! After skiing, when the boots, poles, helmets, jackets, gloves and kids are finally loaded into the car, I barely have the energy to drive home — let alone cook. 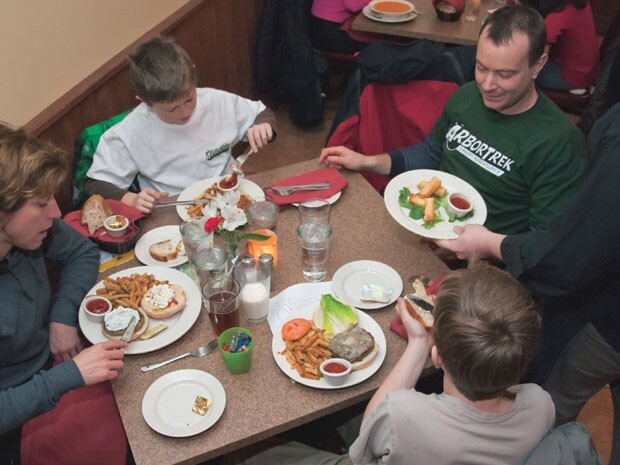 After three attempts to make après-ski dinners for my family of four, it hit me: We could go out to eat on the way home at the Family Table in Jeffersonville, four miles down the hill from Smugglers' Notch Resort. The restaurant was more upscale than I had expected, judging from the casual look of the building. And we found more dating couples, and fewer families with small children, than a "family table" might suggest. I was glad we had at least changed out of our ski pants. The menu was also a surprise. Brined center-cut pork chops, shrimp scampi and grilled lamb chops made me think this is a restaurant where families go to celebrate special occasions, not one where tired moms and dads schlep the kids after skiing. But the food sounded great, so I sat back and enjoyed the early-evening view of the mountains through the picture window. My son did a little fist pump when he learned the soup of the day was clam chowder. "Is the macaroni and cheese from a box or homemade?" he asked our server. "Homemade. It's really good because the chef uses Velveeta." My daughter's hamburger came with fresh-cut fries, and my husband ate his butternut-squash ravioli so quickly I was lucky to get a bite. The salmon I ordered was a little dry, but the roasted potatoes were delicious works of art, cut to look like mushrooms. All the entrées were delicious, but I am almost ashamed to admit that the real hit at our family table was the Velveeta macaroni and cheese. When my son couldn't finish the large bowl, I had some. When I couldn't finish, his sister abandoned her burger and killed it, literally wiping the bottom of the bowl with her bun. Belly full of chowder and mac and cheese temporarily forgotten, my son ordered the Chocolate Trio for dessert — three layers of chocolate mousse on a base of chocolate cake. The rest of us split the Chocolate Madness Cake, a mashup of ganache, gooey cake, brownies and sauce. Now I could call that catnap on the ride home a chocolate-induced coma. By then, the tables in the small dining room were filled with more families than couples, including a combined party of two groups with five kids under the age of 6. Like us, they were there to celebrate nothing more than surviving a cold afternoon skiing with kids. That, and not having to cook. "Out to Eat" is a monthly family-friendly restaurant review. Where should we eat next? Email us at ideas@kidsvt.com. Family-Friendly Amenities: Lunch and dinner kid entrées for $5.95 include burgers, spaghetti and meatballs, and chicken fingers.